Both teams entered the game on the back of obtaining silverware just a week earlier, even less so in the case of Unai Emery’s men. Barcelona wrapped up La Liga with 3-0 victory away at Granada and Sevilla came from 1-0 down to miraculously defeat Liverpool to win their 3rd Europa League in a row and secure Champions League football for next season. A win for either side would secure a double and an excellent end to the season. Barcelona started with their usual line-up with Ter Stegen taking his place in goal, a natural occurrence in cup games. Sevilla made a couple of changes with Sergio Rico, recently announced in Del Bosque’s provisional 26-man-squad, starting in goal whilst Iborra replaced the suspended N’Zonzi. There were no real surprises with Barcelona’s approach to the game with Messi and Neymar starting wide and drifting inside to create openings with the full backs occupying the vacant space on the wings. This tactic can be seen below with Messi dribbling with the ball in a central area looking for the runs of Neymar and Suarez whilst Alba and Dani Alves back up the attack on the wing. Barcelona pressed high to try to pin Sevilla in their own half, keeping the pressure on by quickly retaining the ball. When Sevilla had possession, Barcelona set up in a defensive shape of 4-4-2 with Messi and Suarez occupying the defenders whilst Neymar tracked back to fill in on the left side, as can be seen in the image below. 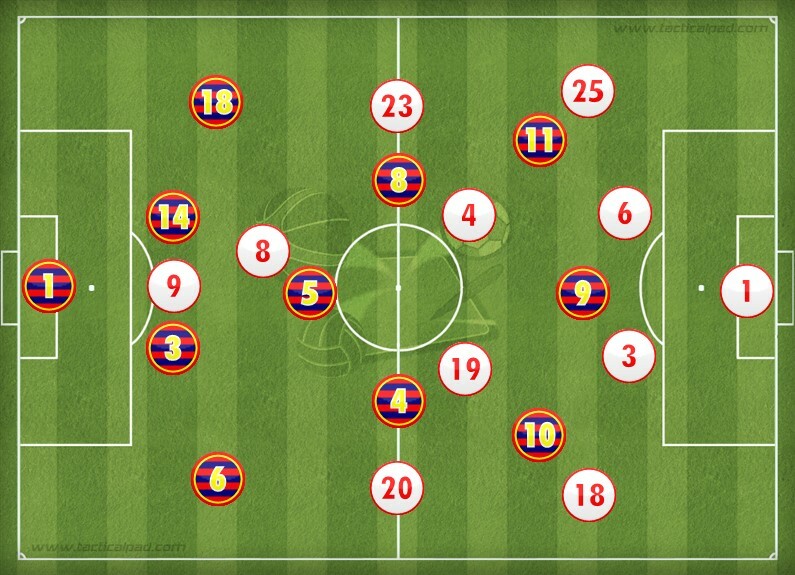 Sevilla started the game with a 4-4-2 formation in order to keep a compact shape and be solid defensively, offering no space between the lines of midfield and defence for the Barcelona players to create chances. By keeping a compact shape, it limited Barcelona’s attacking prowess to passes in front of the midfield with no balls going in behind the defence. When the chance arose, Sevilla used the blistering pace of Gameiro to counter attack Barcelona through direct running at the Barcelona defence. Iborra partnered Gameiro up front to offer a reference point in attack and offer valuable support with his target man capabilities and strength in the air. Following attacks, Sevilla pressed high up the pitch to keep the pressure on and sustain other attacks. Coke started on the right side of midfield, just as he did against Liverpool in the Europa League final, and it was he who had the first chance of the game as Vitolo robbed Iniesta of the ball from the high press and broke past Alba to reach the by-line, pulling the ball back to an open Coke who could not direct his left footed shot on target. The high press can be seen in the image below which led to the first real chance in the game. Unai Emery’s tactic of Iborra playing up with Gameiro was justified when his flick-on led to Gamerio being free on goal before Mascherano brought him down, correctly receiving a red card. Although it may have stopped a goal, Sevilla were one man up and with a dangerous free kick, a key opportunity to go one goal up too. Banega took the free kick which was comfortably saved by Ter Stegen, tipping it over the bar for a corner. Banega started the game deeper in midfield because of his comfort on the ball and his ability to orchestrate attacks from deep and ensure Sevilla had possession of the ball, evading Barcelona’s high press to start attacks. Following the red card, and with 10 minutes in the first half left, Busquets dropped into centre back to partner Pique. When not in possession, Barcelona also changed their defensive shape to a 4-3-2 with Neymar sitting further back but springing forward when possession was in Barcelona’s hands. Nothing much changed defensively but Barcelona had less of a force going forward. The image below shows Barcelona’s temporary defensive shape minutes before half time. Half time brought the introduction of Mathieu for Rakitic with Busquets moving back into his preferred midfield role. Barcelona sat deeper after the interval and Messi dropped deeper to occupy the space on the right to fill in to make a 4-4-1 defensive shape. Barcelona sat deeper and invited pressure from Sevilla, looking to hit them on the counter attack with the pace of Messi and Neymar and the clever positioning of Luis Suarez. As a consequence of Barcelona’s deeper defensive structure, Sevilla pushed higher up the pitch and had more possession due to having a one man advantage and more time and space on the ball. This time and space on the ball led to a powerful shot from Banega which was travelling into the bottom corner was it not for the minor touch from Gerard Pique which angled the ball into the post. Sevilla were on top and a goal seemed imminent. 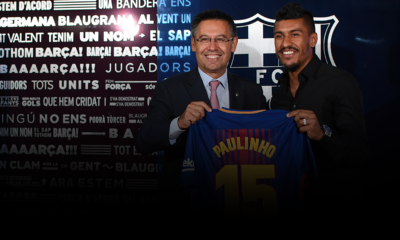 On the hour mark, Suarez went down with a hamstring injury which left Luis Enrique no option but to replace him and Rafinha was introduced on the right side of midfield with Messi pushing up and playing a lone striker. Barcelona looked to keep compact and hit Sevilla on the counter attack – a role reversal for Barcelona. With 10 minutes remaining, Emery brought on the pacey Konoplyanka for the right back, Mariano. Coke dropped back to his more natural right back and, although a positive change, could have swayed the game back in Barcelona’s favour as in the 92nd minute a tired Coke lost the ball following a loose pass and a quick transition from Barcelona led to Neymar bearing down on goal after meeting an inch perfect Messi pass and Banega had no choice but to bring him down to send the game to extra time with both teams a man down. Following Banega’s dismissal, Iborra dropped deeper in midfield and the game became stretched due to tired legs, particularly from Sevilla as they played an intense final just 4 days earlier. The game entered extra-time with tired legs now a major factor. The first goal stemmed from the tiring of the Sevilla players as Vitolo could not track a Jordi Alba run tight enough. Messi played an exquisite pass over the defence to leave Alba at a narrow angle but his cross goal effort found its way into the bottom corner. Barcelona led the cup final and it would take an almighty effort from Sevilla to change it. Fernando Llorente was brought on to cause havoc in the box with his towering height but no crosses were accurate enough to find him and the Sevilla players were running on empty. A red card from Carrico for dissent following a hard, but arguably fair tackle, put the game almost certainly out of reach for Sevilla. Neymar made certain of this as he put the game to bed seconds later after meeting another precise Messi pass which secured Barcelona’s double and left Sevilla ruing a great opportunity to make their own history. It was a tight, cagey game from the start until tiredness from Sevilla and the razor sharp quality of Barcelona’s attacking players ultimately won the game. Sevilla defended well as a unit and if they could have managed to take one of their opportunities or deliver better crosses, the cup could have been heading to Seville. Tactically, Unai Emery could have made changes earlier and pushed the game further by introducing Konoplyanka when Barcelona were on the ropes as slightly better quality could have sent Sevilla ahead. The red card no doubt harmed Barcelona’s chances but determination in defence paired with the undoubtable attacking quality still bailed Barcelona out. Pique and Busquets were phenomenal and without them then Barcelona would not kept a clean sheet and would not have won the cup. Messi and Iniesta were the attacking force behind this Barcelona side and they kept churning out chances before Messi’s class was too much for Sevilla as he ended the game with two assists and Iniesta ended the game with the man of the match trophy. Cup finals are always close-fought and highly intensified but Barcelona showed grit and determination to take the trophy home. They did not only make their mark on the Vicente Calderon turf but also in the history books as Barcelona won the double double. Luis Enrique has won 7 out of 9 trophies as Barcelona boss and it would brave to say he will not win more.